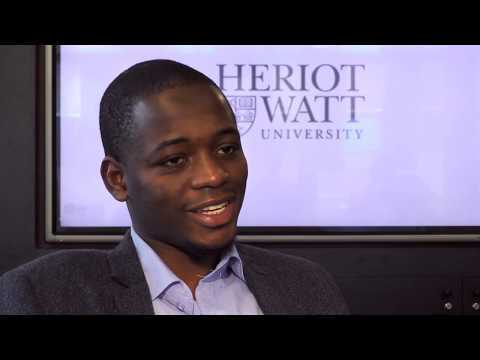 For more information about Actuarial Science at Heriot-Watt University, please visit the webpage using the button above. Our Actuarial Science degree is ideal if you're interested in maths and looking for a course that offers a rewarding career - both intellectually and financially. As 30% of teaching staff are qualified actuaries, this degree also offers current teaching that's always applicable to the real workplace and current economy. There are also opportunities for industry placements and an exchange year in Canada or Australia. Results from the latest Destinations of Leavers of Higher Education (DLHE) survey show that 85% of our Mathematics and Statistics (including Actuarial Science) graduates are employed with a graduate position, or continuing further studies. 95% of our 2017 graduates reported in the National Student Survey that they were satisfied overall with their Actuarial degree. Our Actuarial Science degree is one of only a few to be accredited by the UK actuarial profession. A good performance can mean exemptions from professional examinations (CT1-CT8) too, giving you an advantage over students on other mathematics courses. Graduates who go on to qualify as actuaries with the Society of Actuaries in North America can get credit from some of the SOA examinations on the basis of exemptions from the IfoA examinations. Heriot-Watt has a very active Students' Actuarial Society which won several awards at a recent Heriot-Watt 'Oscars' ceremony. This body is completely managed, enthusiastically and professionally, by our students. With over 250 members, it is one of the largest societies dedicated to actuarial studies in the UK. Regular conferences, professional development and networking events with leading actuaries keep students up-to-date with the profession and in a prime position to begin their careers. The opportunity of a lifetime! The PwC Actuarial Flying Start programme offers, uniquely to Heriot-Watt University's Actuarial Science students, two six-month, paid, PwC work placements during Years Three and Five. It's the perfect way to gain valuable industry experience during your time at university. As an Actuarial Science student at Heriot-Watt University, you will have the opportunity to apply for this programme in Year Two. If successful, you'll join PwC's actuarial team in London and work directly with their clients - helping them plan for uncertainty as well as identifying, quantifying and managing their risks. They are known for the outstanding training they provide to graduates and if you do well, you could also get a job offer for when you graduate. Don't miss out! English language requirements - If your first language is not English, it is important that you gain an acceptable language qualification before joining our undergraduate programmes. The minimum requirement for English language for all our undergraduate Actuarial Mathematics and Statistics programmes is IELTS 6.5. We also offer a range of English language courses to help you meet the English language requirement prior to starting your undergraduate programme.